Voter registration and pre-registration drives during homeroom period at Needham High School are held once or twice a year. These events are held in conjunction with the High School Social Studies Department. Voter registration and pre-registration at the two town fairs in the fall and spring. Voter registration upon request, Contact Us. 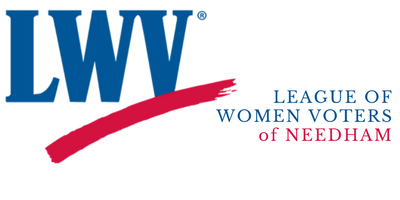 The League of Women Voters Needham annually hosts Warrant Meetings, usually the Monday before Town Meeting starts. Town Meeting Members and the public meet in rooms according to the precinct. Town department representatives informally discuss the Warrant articles relevant to their expertise and answer questions. Held prior to Warrant Meetings, on the same night and in the same location. The Town Moderator presents Town Meeting Member roles and expectations, and answers questions. Intended for newly elected Town Meeting Members, but all are welcome. Watch Joe Kennedy and Gary Rucinski answer questions on a range of issues!